Welcome to Day 3 of TLC for your gut! Sign up for the email if you want to receive a happy-gut tip every day for the next three weeks. Immediately improve your gut health, and make it easy to love your belly, so that your belly loves you! Notably, I am not a professional homeopath, but I am an expert in belly aches. Fortunately, I have treated and learned from brilliant homeopaths over the last 20 years. Using their wisdom, I am excited to share with you my Save-Your-Belly Homeopathic Kit. Homeopathy is wonderful. The treatments are safe to use–for children and adults alike—when applied correctly and in the right doses. My son’s nausea completely disappeared within 10 minutes of taking nux vomica—it was incredible. Nevertheless, medical supervision should be considered concurrent with homeopathic care if serious symptoms persist. Note: these remedies treat immediate distress. Be sure to work with a skilled professional for solutions to long-term problems. Take three pellets on an empty stomach, every 15 minutes when in crisis and thereafter–every hour or two. Homeopathic solutions can be rendered ineffective by strong smells. Therefore, avoid perfume and strong potent like coffee and peppermint. 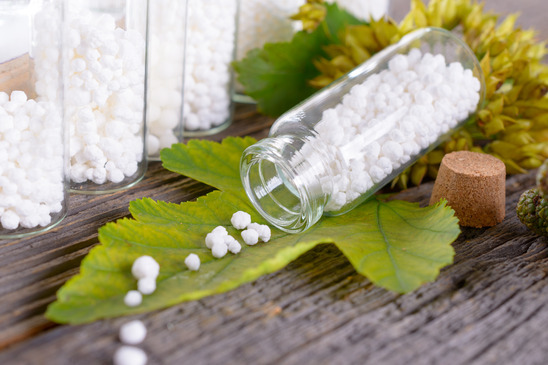 The homeopathic remedies are prescribed based on the symptoms you present. When buying pills, notice each remedy is available in various strengths. Your professional homeopath will use all the different strengths, but 30C is the recommended strength for over-the-counter use. Aconitum 30C: For digestive problems, especially during very hot weather, and if the belly is gassy and sensitive to touch. Symptoms include nausea, vomiting, and diarrhea. Arsenicum Album 30C: This works well if the stomach pain is burning, cannot bear sight or smell of food; vomiting, diarrhea, anxiety, restlessness, and weakness are present, and the person feels better with warmth. This is excellent for food poisoning. Bryonia 30C: Where stomach is sensitive to touch and pressure with dry mouth, thirst, constipation, loss of appetite and cutting pain in the abdomen followed by diarrhea. Pain-free bowel regularity is a key to energy, mood, mental clarity, and detoxification. This translates to going number two on a daily basis. Keep in mind, the goal of good bowel movement is to feel clean and empty afterwards—not bloated, gassy, or constipated. Indeed, if you have seen a toddler use the toilet, you know their bowel movements completely fill the bowl. This is what we should expect from our number 2s. Surprisingly, the colon can hold up to 20 pounds of dead waste! Toxin removal results in bright, clean energy, immune strength, and a sense of well-being. Studies show that humans connect with 2500 chemicals daily. The body is not designed to assimilate or eliminate these toxins. However, we need to remove body poisons–without toxic laxatives. Happy-Gut Reminder: Build the Save-Your-Belly Homeopathic Kit, so it is at hand when needed. Plus, use the HAPPY GUT CLEANSE to fully restore bowel regularity. And, to learn more about how to restore a healthy gut, try one or both of Julia’s books below.